Lifeline’s new adaptation of Richard Adams’s 1974 bunny tale makes for a sharply drawn adventure saga. The most rousing adventure story on a Chicago stage at the moment may well involve rabbits. 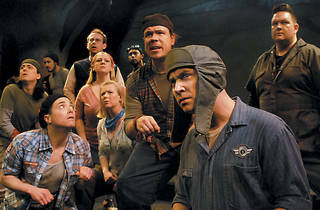 Hildreth’s adaptation of Adams’s 1974 leporine epic skillfully distills the story of Fiver (Scott T. Barsotti), Hazel (Paul S. Holmquist) and the rest of their ragtag band, who narrowly escape the destruction of their warren by a real estate development. As the rabbits make their way to the promised land of Watership Down, their encounters with predators, rivers and rival warrens are sketched at a breathless clip, though Hildreth also makes room for the mythic exploits of the trickster bunny progenitor El-ahrairah (Holmquist). 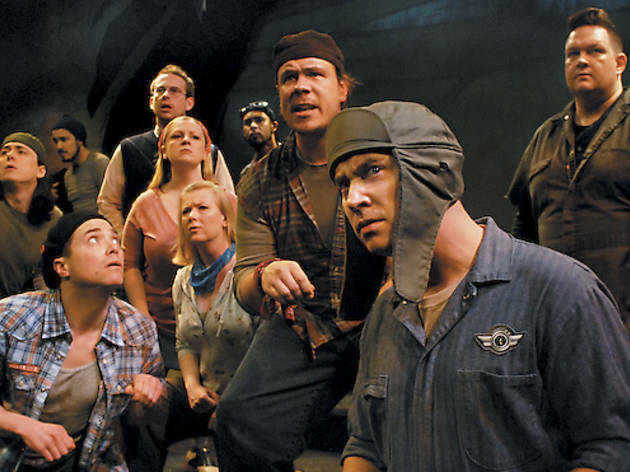 While watching a dozen actors pretend to scratch and hop about for a couple of hours might chill the heart of the most stalwart theatergoer, Lifeline’s physically adept ensemble emphasizes the sharply drawn personae of the different rabbits: reluctant leader Hazel, sardonic bruiser Bigwig (Christopher M. Walsh), brash Silver (Bryson Engelen). Wenhai Ma contributes a projection-centered design both trippy in true ’70s style and effective in abstractly conveying the often brutal violence. The show’s flaws are primarily those of its source material; in particular, the second act’s quest for lady bunnies to repopulate the new Watership Down settlement doesn’t exactly test the bounds of female empowerment. Still, the novel’s message of empathy for the nonhuman world remains alarmingly relevant, and its tale of survival against the odds compelling, especially in this well-wrought production.